Boardwalk Beach Resort offers many different floor plans ranging from efficiency units to three bedroom/three bathroom with bunk room floor plans. Each floor in the Boardwalk Condos has up to 13 units, if you count lock out units. The layouts provide for amazing gulf coast views and many units feature large windows in addition to the sliding glass doors that lead out to the balconies. 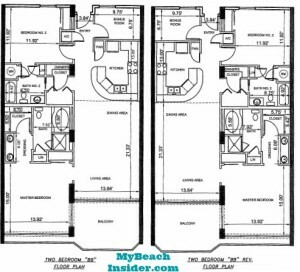 Boardwalk Beach Resort offers efficiency floor plans in select units called Unit E. These units can be found in units that end in 00 and are 505 sq ft.
As you enter the unit, you’ll turn to your right and walk through the entry. On the left of the entry corridor you’ll see a utility closet. Just past the closet is a kitchenette with a sink, microwave and dishwasher. Straight ahead is the master bedroom area with a sliding glass door that leads out to the balcony. These balconies face east. As you re-enter the unit from the balcony you’ll see an entrance to a dressing area on right side of the far wall. This area has a closet and two sinks. There is a doorway straight ahead for the bathroom which has a linen closet, a stand up shower and a separate bath tub. There is also a glass block window in the bathroom. 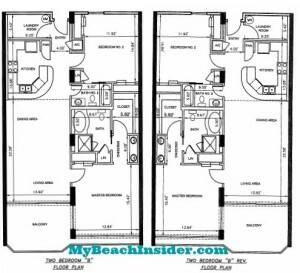 Boardwalk Condos offer one version of their one bedroom/one bathroom floor plans and they’re called Unit D. This floor plan can be found in units that end in 05, 06 or 07 and they are 745 sq ft each. As you enter this layout, you’ll see a closet straight ahead. To your left, you’ll see the entrance to the bedroom. This bedroom has a basic closet and access to the bathroom which is shared with the unit. This bathroom has one sink, a toilet and a shower/tub combo. Further down the entrance hallway, you’ll see a washer/dryer closet on your right and the hallway entrance to the bathroom on the left. Past the washer/dryer closet on the right is a bunk area or storage area depending on what the owner prefers. There will also be a pantry on your left. As you continue walking into the unit, you’ll see the kitchen on your left and an AC closet and owner’s closet (which will probably remain locked) on your right. After this, the unit opens up into the living/dining area. Splitting the kitchen and the living area is a dining bar. On the far wall is a sliding glass door that leads out to the beach front balcony. There are also windows on each side of the sliding glass door that are almost floor to ceiling to let more light into the unit and expand your view. 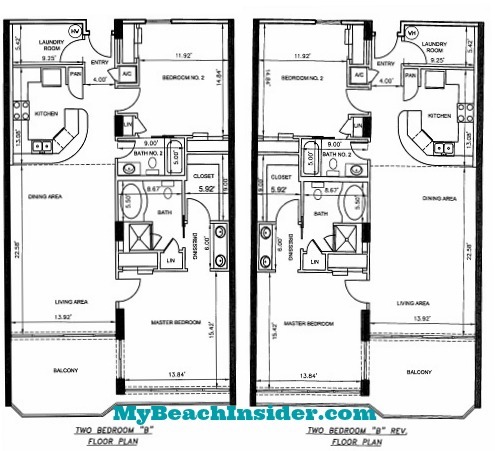 Two floor plans in Boardwalk, as well as their reversed versions, offer a two bedroom/two bathroom layout. The first is Unit B which can be found in units that end in 10. There is a reversed (mirrored) version of this floor plan as well, which can be found in units that end in 02. These layouts are 1,380 sq ft.
As you walk through the front door of the regular version of the floor plan, you’ll immediately see a laundry room on your right that has a washer, dryer and hot water heater. Just a step further into the unit, you’ll see an AC closet on your left. Past the AC closet, the kitchen will be on your right and the first bedroom will be on your left. The kitchen has a dining bar that separates the kitchen and living area for extra dining seating. The first bedroom has two closets, a linen closet and access to a bathroom via a pocket door. This bathroom is shared with the unit. As you walk further into the unit, you’ll see the main entrance to the first bathroom on your left. The unit now opens up into the dining area and living area. On the far end of the unit is a sliding glass door that leads to the gulf front balcony. On either side of the sliding glass door are huge windows that expand your view from within the unit. As you walk through the living area, right before you reach the balcony, you’ll see a door leading to the master bedroom on your left. The master bedroom has a sliding glass door leading out to the main balcony area, as well as a dressing area with his and her sinks, a walk-in closet and a regular closet. The master bathroom has a separate shower and tub, as well as a linen closet. The master bedroom has huge windows on the south wall that give the illusion of having the whole wall open to the beach and gulf. There is even a railing on the other side of the windows to make it feel like your gulf front master bedroom is actually a balcony! The other version of the floor plan, Unit B Reversed, is an exact mirror copy with no other differences. 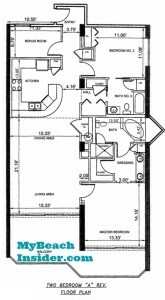 The second two bedroom/two bathroom floor plan is called Unit C. These layouts can be found in units that end in 09. Unit C has a reversed (mirrored) version as well which can be found in units that end in 03. 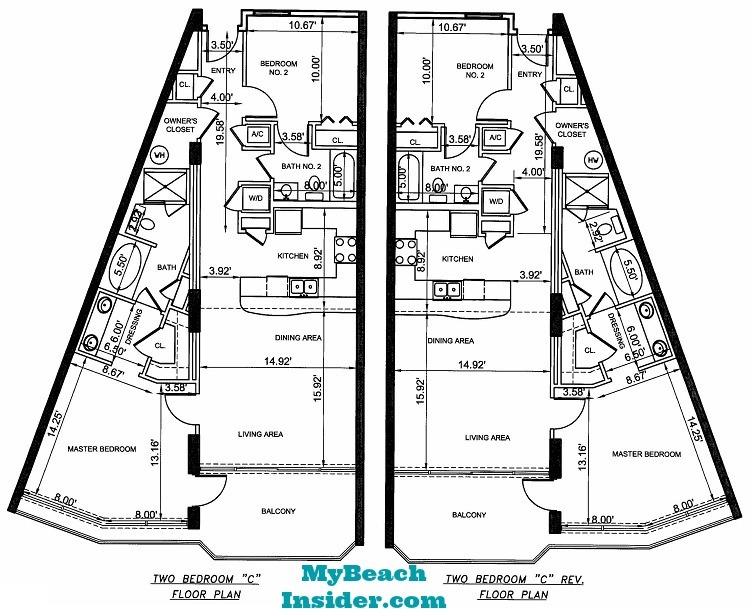 Both versions are 1,152 sq ft. The floor plan is unique because it is shaped like a wedge. As you enter this layout, you’ll see a closet on your right, followed immediately by an owner’s closet (very likely to be locked) that is also on your right. On your left is the entrance to the first bedroom. This bedroom has a closet and access to the first bathroom, which is shared with the rest of the unit. Back in the entry, past the first bedroom you’ll find an AC closet on your left. Immediately after the AC closet is the hallway entrance to the first bathroom which has a single sink and a shower/tub combo. Past the hallway bathroom entrance, you’ll find a washer/dryer closet on your left. As you continue walking into the unit, the floor plan opens up into the kitchen which is on your left. As you enter the kitchen, there is a pantry immediately on your left. Walking further into the unit, you’ll see there is a dining bar between the kitchen and the living/dining area. On the far side of the living area is a sliding glass door that leads to the balcony. On either side of the sliding glass door are enormous windows that expand your gulf front view, rather than walls. On the right wall of the living area is the entrance to the gulf front master bedroom. The gulf front master bedroom isn’t a normal rectangular shape, but the extra space is awesome. You’ll have two different angled walls of windows that face the beach. Outside of the huge windows is a railing to give you a balcony feel from within your master bedroom. There is also a door that leads out from the gulf front master bedroom to the main balcony area. The master bedroom also has a dressing area with his and her sinks as well as a walk-in closet. The master bathroom has a separate tub and shower, a toilet and another closet. The other version of the floor plan, Unit C Reversed, is an exact mirror copy of Unit C described above. 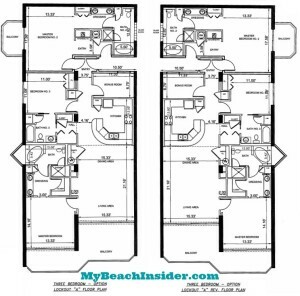 Boardwalk Condos offer two versions of a two bedroom/two bathroom with bunk room floor plan, along with a reversed version. The first is called Unit BB. The regular version can be found in units that end in 08 and the reversed version can be found in units that end in 04. They have 1,380 sq ft.
As you enter the Unit BB layout, you’ll see the bunk room (called a bonus room) on your left and an AC closet on your right. Just past the AC closet is the first bedroom, also on your right. The first bedroom has a closet and access to the first bathroom which is shared with the rest of the unit. This bathroom has a water heater closet, a linen closet, one single sink and a shower/tub combo. Back in the entry hallway, as you continue walking into the unit you’ll see the kitchen on your left. Walk into the kitchen and the pantry will be immediately on your left. The kitchen has a dining bar that separates the living and dining area from the kitchen. Across the kitchen, on the right side of the entry way is a small hallway with two closets that leads to main entrance to the first bathroom. As you enter this hallway, an owner’s closet will be on your right (it will probably be locked) and another closet will be on your left. Past the kitchen and small closet hallway is the dining and living area. It is separated from the kitchen by a dining bar. On the far wall is a sliding glass door with large windows on either side that leads to your gulf front balcony. The views are amazing! On the right wall of the living area is the entrance to the gulf front master bedroom. The master bedroom has large windows that makes your bedroom feel like a balcony. Just outside the windows are railings, just like on a balcony. There is also a sliding glass door that leads out onto the main balcony from the master bedroom. The master bedroom has a closet and a master bathroom. As you walk into the master bathroom area, on the north side of the room, there is a dressing area with his and her sinks. Straight ahead is a walk in closet and to your right is the bathroom area. There is a separate tub and shower, a toilet and a linen closet. There is a reversed (mirrored) version of this floor plan that is an exact mirror copy. 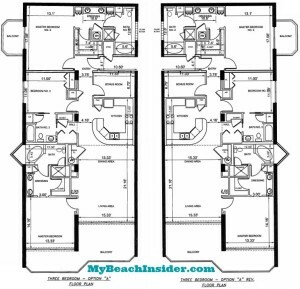 The second version of a two bedroom/two bathroom with bunk room floor plan is called the Two Bedroom Unit A Reversed. 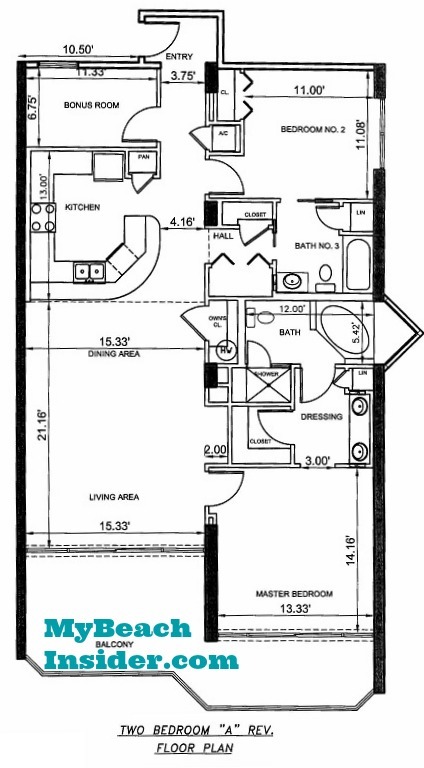 Ironically, there is no regular version of this floor plan and the reversed version is the only Two Bedroom Unit A. These can be found in units 801 through 2101 and they are 1,481 square feet. As you walk into the entry, you’ll have to turn to your right to enter the unit’s hallway. On your right is the bunk room (called a bonus room). On your left is an AC closet. Just past the AC closet is the first bedroom, also on your left. This bedroom has access to the first bathroom which is also shared with the rest of the unit. The bedroom has a standard closet. Back in the hallway, the kitchen will be on your right. As you enter the kitchen there is a pantry immediately on your right. A dining bar separates the kitchen from the rest of the unit. Continuing down the main hallway, there is a smaller hallway on your left that leads to the first bathroom. In the small hallway, there are two closets, one on your left and one on your right. Straight ahead is the bathroom.This bathroom, shared with the first bedroom, has a shower/tub combo, a linen closet, one sink and a toilet. Past the kitchen and dining bar, the unit opens up into the dining and living areas. On your left is an owner’s closet and just past that is a small alcove. Just past the alcove, also on your left, is the entrance to the gulf front master bedroom. Straight ahead is a sliding glass door leading to the gulf front balcony, as well as windows on either side of the sliding glass door to enhance your view. When you enter the gulf front master bedroom, a sliding glass door with windows on either side will be on your right. Outside of the sliding glass door is an extended balcony that you can walk out onto. On your left, inside the master bedroom, is a dressing area with his and her sinks, a linen closet and a walk-in closet. Past the sinks is the bathroom which has a toilet, stand up shower and separate bath tub. Behind the bath tub, the wall extends past the normal wall of the condo building to offer two 45 degree windows with amazing views. 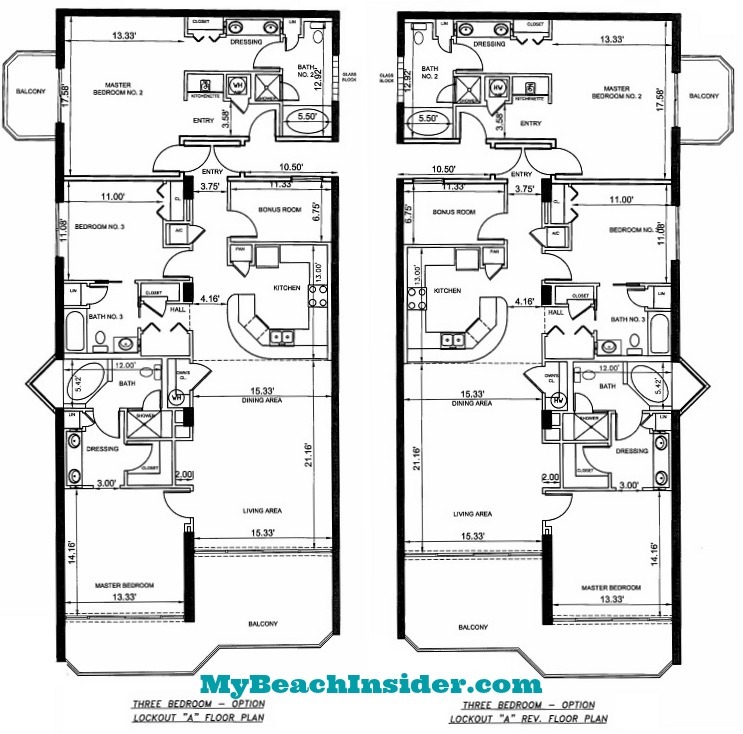 There are two types of three bedroom/three bathroom with bunk room floor plans at Boardwalk Resort in Panama City Beach. They are very minor differences between the two. There are also reversed versions of each of these layouts. 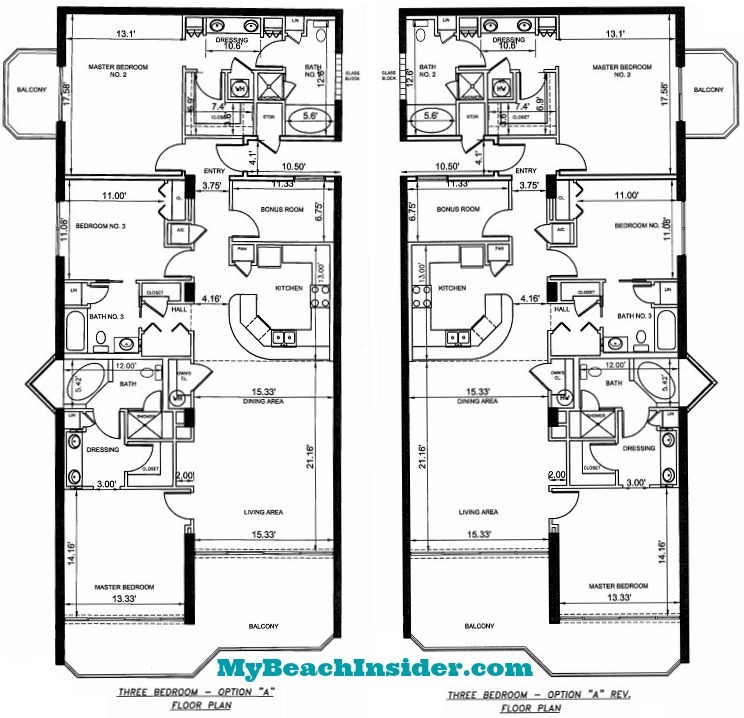 The first version is a full three bedroom/three bathroom floor plan with a bunk room and is called Unit A. 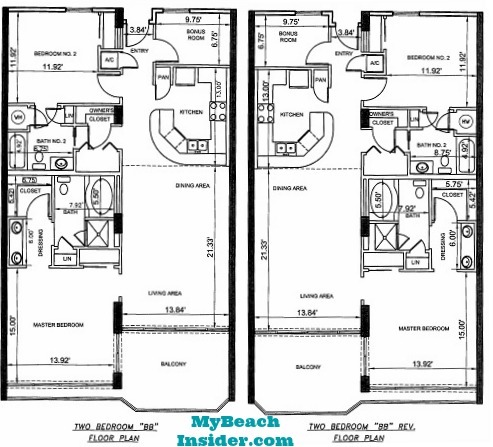 This floor plan can be found in units 0511, 1511 and 1611 and is 1,986 sq ft. There is also a mirrored version of this floor plan that can be found in units 0401 and 0501. As you enter Unit A, straight ahead will be the first master bedroom. This master bedroom has a west facing balcony (in units that end in 11) or an east facing balcony (in units that end in 01). It is on the far wall from where you enter the bedroom and has sliding glass doors leading out to the balcony. On the same wall you entered the bedroom from is access to the master bath area. First you’ll encounter a dressing area with his and her sinks, a water heater closet and a walk in closet. Through the door straight ahead is the bath area which has a linen closet, a stand up shower, a separate bath tub, a toilet and a glass block window for natural light. Back at the front door of the condo unit, if you take a left you’ll be in the main hallway. You’ll see the bunk room (called a bonus room) on your left and an AC closet on your right. Just ahead, the second bedroom is on your right. This bedroom has a closet an access to a bathroom shared with the rest of the unit as well as a window. In the hallway, across from the second bedroom, you’ll find the kitchen to your left. As you enter the kitchen, there is a pantry immediately on your left. The kitchen and dining/living area is separated by a dining bar. As you walk past the kitchen in the main hallway, you’ll see a small hallway on your right. This hallway leads to the shared bathroom which has a shower/tub combo and a linen closet. In the hallway itself, there are closets on both your left and right. As you continue into the living/dining area, you’ll see an owner’s closet on your right (likely locked) followed by an alcove. After the alcove is the entrance to the gulf front master bedroom. Straight ahead is the sliding glass door that leads to the balcony. On either side of the sliding glass door are huge windows that expand your gulf front beach view. As you enter the master bedroom, there is a wall of windows and a sliding glass door that leads out onto the balcony on your left. 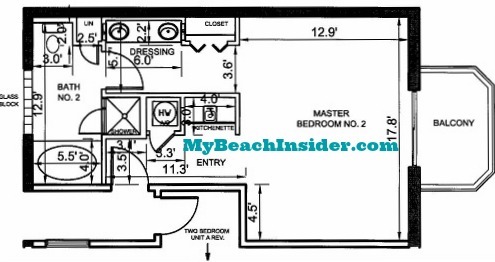 The balcony is extended, unlike in the Unit BB floor plan, to allow you to enter the balcony from the master bedroom. On your right is access to the dressing area with his and her sinks, a linen closet, as well as a walk in closet. Through the dressing area is the entrance to the master bathroom which has a stand up shower, a separate bath tub and a toilet. 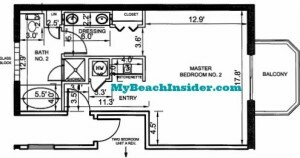 There is also a neat area over the bath tub that extends past the main wall of the building, giving you 45 degree views of the beach and back toward the first master bedroom’s balcony. The views are awesome from the bath tub! There is a reversed (mirrored) version of this floor plan that is exactly the same except for the fact that it is mirrored. The second version of the three bedroom/three bathroom with bunk room floor plan is a lockout layout called Lockout Unit A. It is identical to Unit A described above with the exception of the first master bedroom which is changed to a lockout unit. These lockout floor plans can be found in units 0211, 0311, 0411, 0611, 0711, 0811, 0911, 1011, 1111, 1211, 1411, 1711, 1811, 1911, 2011, 2111, 2211. The reversed version of the floor plan can be found in units 0201, 0301, 0601, 0701 and 2201. Depending on the owner, the whole entire unit can be rented together as a three bedroom/three bathroom with bunk room unit or the units can be split to be rented as a two bedroom/two bathroom with bunk room unit and an efficiency unit. Be sure to ask which you are renting if it is important to you. Since the main area of this floor plan is the same as Unit A, we’ll only be describing the differences caused by the lockout portion of this floor plan. When you enter through the main entrance to the larger floor plan, instead of directly accessing the first master bedroom straight ahead, there will be two sets of doors. The first is in the main area and the second is in the lock out. Both must be unlocked to enter the lock out area. The new main entrance to the lockout unit is in the building common area on the north wall. As you enter the unit, you’ll turn left into the entry way. On your right is a water heater closet followed by a kitchenette. Straight ahead is the master bedroom area and on the far wall is a sliding glass door leading to the balcony. The balcony faces west in units that end in 11 and east in units that end in 01. On the same wall as the entry hallway, you’ll find the entrance to the rest of the unit on your left through the two lockout doors described earlier. On the right is the dressing area that has a standard closet as well as his and her sinks. There is a door leading into the main bath area that has a linen closet, toilet, stand up shower and separate bath tub. There is also a glass block window to let in light. Everything else in the Lockout Unit A layout is exactly the same as the regular Unit A layout. A reversed (mirrored) version of this floor plan exists and it is the same exact layout except for the fact that it is mirrored. 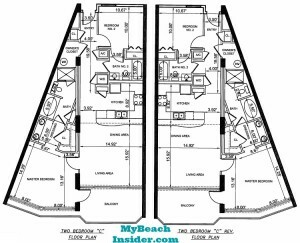 If you’re heading down to Panama City Beach, Florida, you definitely need to check out the rest of MyBeachInsider.com to find out information only the locals, or insiders, like me know! 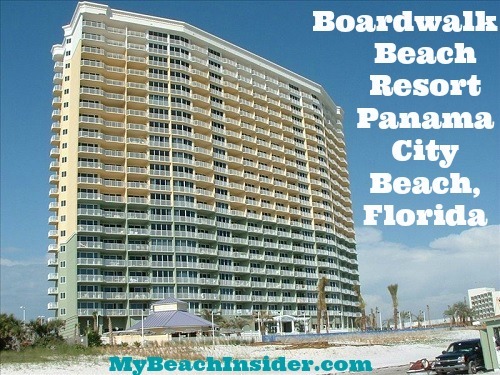 Learn about places to eat, things to do and all about the Panama City Beach condos!